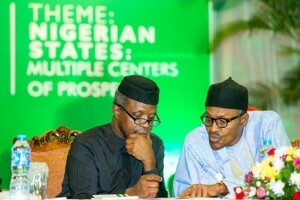 The weekly Federal Executive Council meeting will not hold today. This was made known by the President Muhammadu Buhari’s spokesman, Femi Adesina, in the early hours of Wednesday. No reason was given for the cancelation. He, however, said President Muhammadu Buhari will receive the probe report on the allegations against the suspended Secretary to the Government of the Federation, Babachir Lawal, and the Director General of the National Intelligence Agency, Ambassador Ayo Oke, at 12 noon. The probe panel was headed by the Vice President, Prof. Yemi Osinbajo. It was set up to probe Lawal for his role in a some contracts on the clearing of grass in the North East by a company linked to him. Oke was probed for the role of the NIA in the huge funds found in a Lagos home in cash. The presentation of the probe report will hold at the office of the President in his residence at the Presidential Villa, Abuja.